by Beauchamp, Tom L.; Childress, James F.
Tom L. Beauchamp is Professor of Philosophy at Georgetown University. 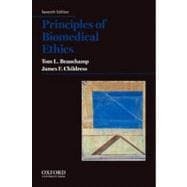 James F. Childress is University Professor and John Allen Hollingsworth Professor of Ethics at the University of Virginia. Each chapter ends with a Conclusion.